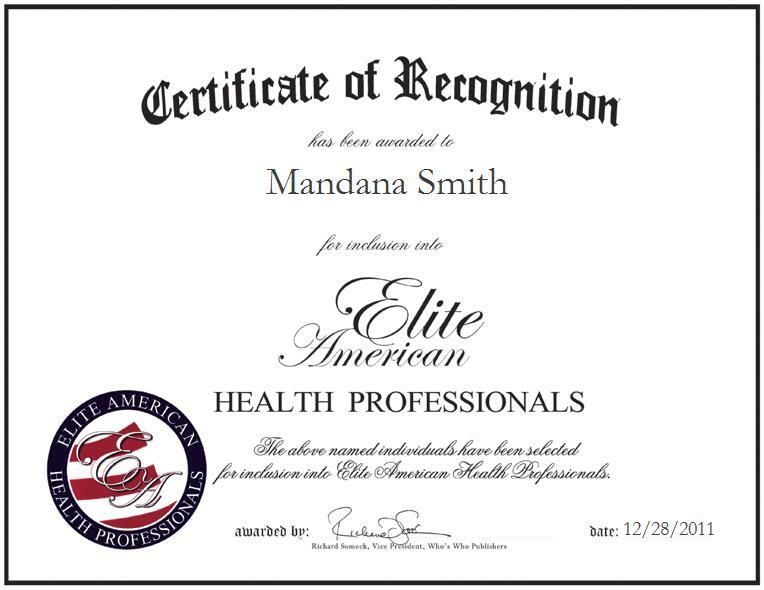 NORTH RIDGEVILLE, OH, December 28, 2011, Mandana Smith, Hospital Corpsman for the United States Navy, has been recognized by Elite American Health Professionals for dedication, achievements, and leadership in hospital management. For nearly two decades, Ms. Smith has built on an ever-expansive skill set in the area of hospital management, and she feels she has proven successful in her endeavors due to sheer hard work and dedication. In her current capacity, she is responsible for supervising clinics, overseeing care for junior staff, and managing medical records and physicals. For more than 17 years, Ms. Smith served in the United States Navy. With a resolve to productively utilize her excellent leadership and management skills, she followed a career path that would allow her to support the goals of the country she loves. Ms. Smith is now a retired combat veteran who has completed two combat deployments to Iraq. She has maintained a commitment to learning and growing as a professional, and remaining abreast of current trends and developments, as well. She is a member of her local Motor Transport Association, and she remains focused on learning new methods that will help improve services at the clinics that she supervises. When she is not working, Ms. Smith enjoys spending time with her mother and motorcycling.